As a high school basketball player many years ago , Kathy suffered a high ankle sprain during a basketball game and was told that she may not heal in time to play in the state playoffs. This news was especially disheartening because this was her Senior year. After spending 4- 6 weeks in a cast the Orthopedic surgeon referred her to Physical Therapy to rehabilitate her injury so that she could return to the sport she loved by district playoffs. It was during that rehab process she decided that she was going to become a Physical Therapist. She then attended Jackson State University (1983-1987) receiving a B.S. degree in Biology and proceeded to Physical Therapy school at Florida A&M University (1987-1989). Over the years she has worked in various setting from Acute Care Orthopedics, Home Health, Outpatient Physical Therapy and most recently Private practice Outpatient Physical Therapy for the past 15 years. She has always had a compassion to participate and facilitate the healing of the human body after injury. Kathy feels that “Our goal is to always put the patient first…..which is rare in todays society.” She strives to give the best care possible to her clients providing " REHAB FROM THE HEART'. Menika earned her Bachelor of Science degree from Jackson State University in 2004. Following graduation, she became a licensed massage therapist and certified pilates instructor. Over the next several years, this allowed Menika to better help people with life, stress, and chronic conditions though a combination of both services. Menika’s love for the human body and helping people led her to attend Meridian Community College where she majored in Physical Therapist Assistant and graduated with honors in May 2013. Menika enjoys working with active individuals and promoting “wellness” programs for after therapy services. 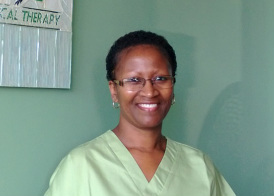 She enjoys interacting and individualizing therapy programs based on the needs and function of her patients. Her personalized approach to the patient makes her one of a kind. 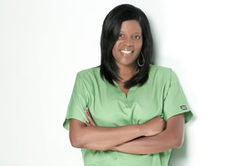 Angela has been in the medical profession for over 19 years serving in various positions in the office. 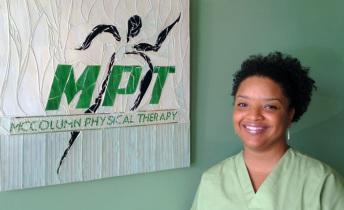 She has been with McColumn Physical Therapy for 8 months as the Billing Manager. Angela is responsible for all office duties related to billing including insurance verifications or approval for therapy (workers compensation) as well as making patient payment arrangements. If you have a prescription for Physical Therapy and are unsure about whether your insurance will cover our services ? Contact us and ask for Angela. OUR STAFF….WE TAKE IT PERSONAL IF YOU DO NOT GET BETTER! We pride ourselves with providing a “hands on approach” to provide us with more insight into a patients condition. The laying of hands enables us to detect changes in tissue tightness, tissue temperature, joint mobility, muscle flexibility and muscle tone that may not be detected by a machine. Using a combination of manual therapy, specific therapeutic exercise, modalities and various other techniques for pain management, strengthening, stabilization, and flexibility , our goal for you is full recovery.